Welcome, Newbies. You’re in the right place with Susan’s reports. She’s just getting started with 2.5mg potency, daring to go all the way up to 10mg THC. I recruited my neighbor to help me try my first edible. We rechristened ourselves Cheech 'n' Chong. We split one 5mg wafer and sipped mineral water while waiting for it to take effect. An hour in, Cheech was feeling lightly buzzed while I was feeling nothing. We split another wafer, bringing our total dose up to 5mg each. Half an hour later, Cheech reported her ears felt blocked and her eyes felt squinty and things were funnier and colors were more intense. I felt bupkiss. Except I had a mild sinus pressure headache and my eyeballs were slightly ill fitting. Plus a little bit of a hemp oil taste in the back of my throat. That was it. I was disappointed. I liked the taste of this Ganache, rich and smooth and chocolatey. No flavor of cannabis. The first time I started with half a teaspoon, or about 2.5mg. I waited an hour and felt bupkiss. O no, is this going to be my ongoing experience? I took another half teaspoon and waited another hour. I couldn’t be sure, but I felt good. Pleasant. Light. It was very subtle though. I mean most of the time I feel pretty good, pleasant and light. I went to bed, slept well and awoke fresh and dewy-skinned greeting the dawn with a trilling songbird perched lovingly on my finger, as always. Next time I try this product, I will start with 1.5 teaspoons for a total of 7.5mg and see how I feel. I started with 5mg or half of a 10mg square. The flavor was lovely, rich chocolate, smooth texture. It did leave a strong pot oil flavor in the back of my throat, but it wasn’t off-putting. I enjoyed eating it and was sad to only have half. I waited an hour, felt no effect, so went for the second half. I let it melt in my mouth, and this time the chocolate and the cannabis oil flavor melded better. An hour went by and still nothing. So I consoled myself with a glass of wine. Half an hour went by, and as I nibbled on a cheese and cracker snack, I realized that my eyelids were now truly embracing my eyeballs, not just poking out to stop the orbs from rolling down my cheeks. Lovely little dears…hmm this is encouraging. I enjoyed a sense of general well-being and felt a bit proud of myself. Yay! I finally am beginning to understand what all the fuss is about. I tried this chocolate after a day of drinking a bit too much coffee, around 6pm, so I was a little wired to begin with. 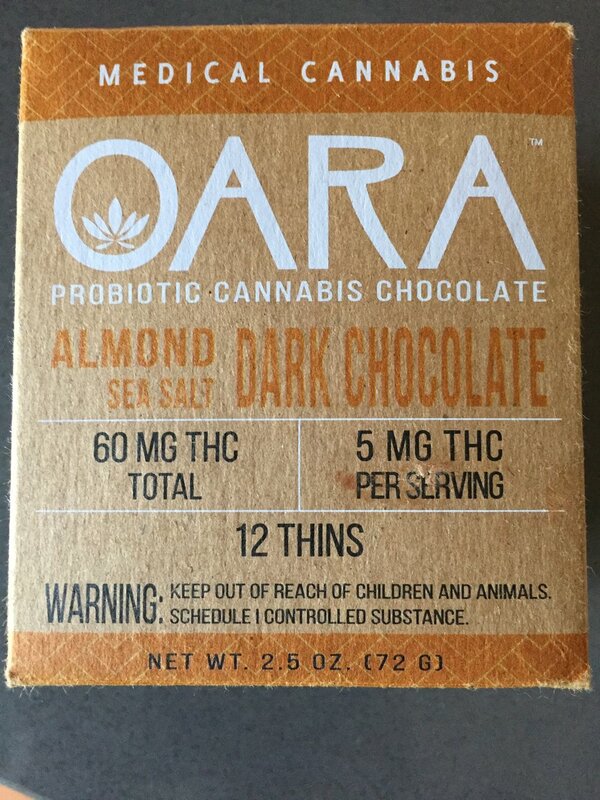 I wasn’t paying a ton of attention and ate the whole thing rather quickly, figuring the low dosage would not affect me too much - especially because of the high THC to CBD ratio. The chocolate itself was good. It was rich with a slight oily taste. I don’t know exactly when the chocolate took effect, but when it did it was intense. My brain was buzzing and I had to go to lay down because I started to feel dizzy. I tried to watch something on Netflix but it was too much stimulation. At some point the black and white pattern on my duvet and carpet started vibrating. I ended up falling asleep but had trouble finding my balance when I got up to pee. Yikes! Clearly this dosage was too high for me, but if you enjoy that kind of effect then this treat is for you.